This thread is the result of a conversation that happened between @mefisme, @huphtur, @ronji and me over on the Discord chatroom about opportunities for collaborations on iOS. After several deadend ideas about the possibility of live collabs, we stumbled into the concept of bounce and share. The idea is simple. This thread will host several starting stems which anyone is welcome to download, layer and/or expand, then bounce and re-share here. Other users can either start their own track from the starting stem, or pick up one of the already-expanded versions and continue working on that... whatever inspires them to be creative. Feel free to download, expand, mangle, bounce and share... or submit your own starting stem below. Think of it just like forking a project on GitHub. Browse this thread for something that inspires you, add something to it (a little or a lot) and then export to wav and re-post it here. Are the bounce stems to be dry or can/should we add FX to them? Great co-op idea! Thanks for sharing. Sampled Reaktor last night after seeing this thread. Trimmed down to the sample, Fade Ins+Outs, EQ'd, killed <20Hz+DC_Offset, peak norm'd to max -3db, RMS norm'd the quiet ones, etc. Unusual/Experimental sounds to go with @tk32's 90bpm stems above. 24 16bit 44.1kHz WAV samples (90bpm loops that can be used as stems). 61MB. (The loops are in the zip file named "Reaktor90bpmLoops1.zip". @tk32 I've began to mangle. @TONBOGIRI Thanks for participating! I'm happy to make some new ones in completely different styles. Hopefully one of them will spark some inspiration. Stems perfect for me jamming APC40. Great inspiration so far from you @tk32 and @TONBOGIRI. Seeing how much I can do with the ones we have so far! Stems exchange a great idea. I'm getting back into Kore & Reaktor, so I'll upload more 90bpm stems & loops. They'll be weird as usual though. I'll do Alchemy & Cameleon5000 too since they're filled with lots of great soundscapes, pads, & sequences. Maybe some stuff from Korg Legacy Collection, Tassman, Analog Lab 3, etc. I've got lots of Eurorack stuff, but unfortunately didn't take notes (pitch or tempo, etc.). I've never heard any of this stuff so I'm sure it's a real treat! I suppose you're just being humorous, but if you're not, those are classic software synths for Mac OS & Windows. And based on your posts & ambitious APC40 Project, I'd say that you may enjoy Native Instruments Reaktor 6, for a lifetime. It does everything: synths, samplers, fx; MIDI, CV/Gate, every conceivable type of sequencer, tool, etc. Use one of the hundreds of built-in instruments, connect them together, or download tens-of-thousands from the User Library. Or read the manual, watch videos, and build your own. It's been going strong for 20+ years. Or just use it for sample fodder. $200, was $400, but around the holidays it's $100. But I suspect that you're a Pure Data or Max|MSP guru. If so could you please upload some stems to Dropbox to share? @TONBOGIRI I still have not purchased NI Reaktor. Way behind the times. I see there is a new iOS app called Reaktor. Is it any good? I'll try to get some stems out. Think I was trying to match what's been posted by you and @tk32 but having tough time finding something fitting. And I'm just a regular user of BM3 who uses APC40s to control it. It was a neat idea at the time. You just remind me of the algorithmic composition gurus. That's a compliment. If a small hardware company makes a controller for BM3, it should be open-source like the Monome Grid. There are many 3rd-party templates for the Monome, which remind me of your APC & ERNs tools. I'm just now learning ERNs. I love thinking-outside-of-the-box approaches. Thanks for this. Reaktor: I doubt it'll ever come to iOS. There's VCVRack now (desktop), & it's free, but I'm not keeping my fingers crossed for an iOS port. Plus Reaktor allows for low-level editing. You really need a large monitor for this. I was obsessed with the monome for a while, and in particular obsessed with mlrv. I spent a lot of time trying to use my iPad as a monome. I've got SunVox and Audulus 3, and I wish I had more time to learn them. There's a monome controller in Audulus, but it doesn't make sense without multitouch, and I heard multitouch won't likely come till Audulus 4, likely a different app and not a free upgrade. Which is fine, if it's true. That app is insane. Kid Sputnik & others made several Reaktor ensembles that are similiar to mlrv and a few other monome & Max apps. Reaktor supports TouchOSC but I've yet to try it from the iPad. Just checked - TouchOSC is $5 and still being updated. Hmmmm. 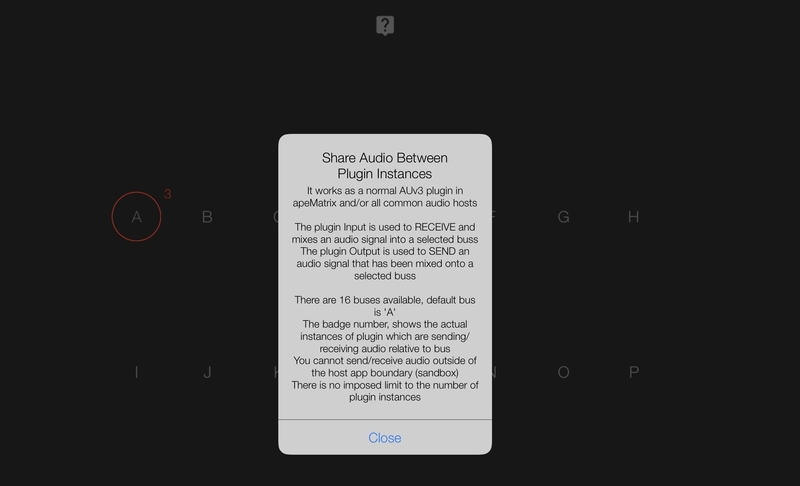 Plus I'm looking forward to the day one of these iOS modular apps gets the AUv3-treament. Imagine SunVox MetaModules or Audulus 4 as an AU! I read they're slowly working on it. I’m working on ERNs actually today. Looking for ways to improve it, add the training, more scales, and a chord progressions bank. Any thoughts? Definitely some macros! There’s so much that has me wanting to trigger finger on purchases. @mefisme Re: ERNs - give me a bit to wrap my head around it first, plus I'm digging through similar Reaktor ensembles for ideas, & I'll send them later. BM3 Pad-to-Pad Audio + MIDI? Really? Is that coming? Or just on the wishlist? Anyone try the latest apeMatrix update that has 2 new AUs for Mixer Send Receive? Apparently it's for subgroup mixing. 16x buses.